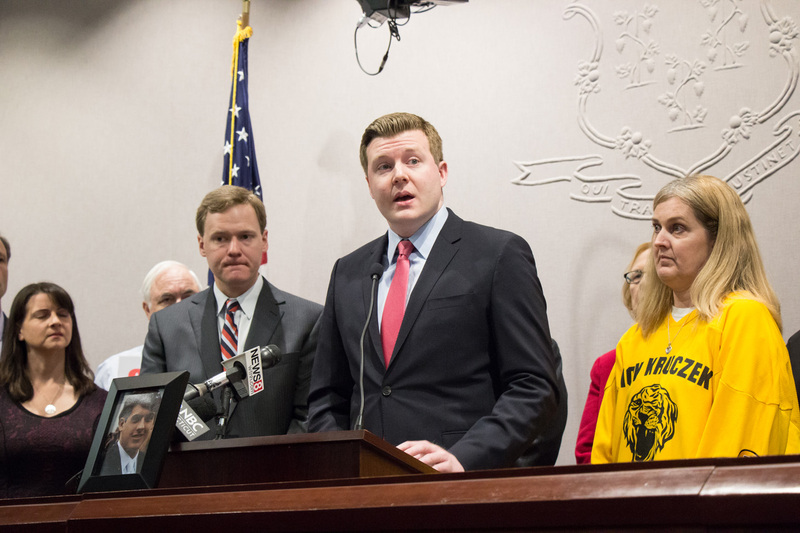 Representative Sean Scanlon held a press conference with his friend and Guilford parent Sue Kruczek to unveil a bill he co-authored to limit first-time and non-chronic opiate prescriptions for adults to a 7 day supply and all minor's prescriptions to 7 days. Sue's son Nick lost his life to a battle with addiction that began with pain pills given to him by a teammate. Overprescribing of these highly addictive drugs makes this a far too common story and this bill will go a long way towards reducing the number of excess pills in our society that often end up in the wrong hands. Whether it's meeting with parents who have lost children, talking with medical experts or riding around with our police officers, Rep. Scanlon has done a lot of listening when it comes to what we can do to address the root of the problem and S.B. 352 is the culmination of that listening. We need to get those already addicted help but, more importantly, we have to prevent further people from becoming addicted in the first place and this bill will help do that. This opiod bill passed unanimously in Public Health Committee.